Some players knelt during the National Anthem during the first preseason games of the season for the National Football League (NFL). The kneeling was supposed to come to an end due to a policy announced by the league in May that would have disciplined any player that didn’t stand during the anthem, but would have allowed players who didn’t want to be present for the anthem to stay in the locker room while it was played. Instead, the NFL Player Association spoke to top NFL executives and the two groups in a joint statement announced a freeze on the new policy while they negotiated. The freeze is still in place and negotiations are still ongoing. Two Miami Dolphins players, wide receivers Kenny Stills and Albert Wilson, knelt before the Dolphins’ Aug. 9 game against the Tampa Bay Buccaneers, who all stood for the anthem. On the Dolphins sideline, defensive end Robert Quinn raised his fist during the anthem. 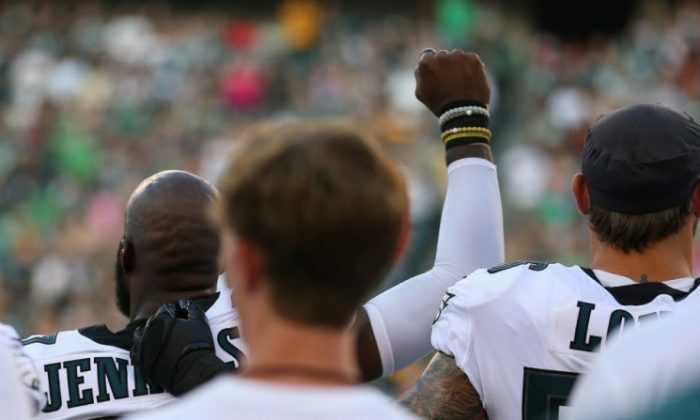 Philadelphia Eagles safety Malcolm Jenkins and cornerback De’Vante Bausby also raised their fists during the anthem while defensive end Chris Long placed his arm around Jenkins’ shoulder. The Eagles played the Pittsburgh Steelers, none of whom appeared to kneel or raise fists during the anthem, reported NFL.com. Eagles’ defensive end Michael Bennett was not present during the beginning of the anthem and walked out of the tunnel as it played. Prior to the anthem being played, three Seattle Seahawks players sprinted into the tunnel leading to the team’s locker room and didn’t re-emerge until after it played. Defensive linemen Branden Jackson and Quinton Jefferson, and offensive lineman Duane Brown left the field following team introductions, reported the Associated Press. Four Jacksonville Jaguars players also remained in the locker room during the anthem. They were cornerback Jalen Ramsey, linebacker Telvin Smith, and running backs Leonard Fournette and T.J. Yeldon. Before the Baltimore Ravens and New England Patriots played in New England, all players stood but Ravens linebacker Tim Williams stood with his back toward the field. The Patriots observed a moment of silence before the anthem for Massachusetts police officer Michael Chesna, who was killed in July in the line of duty. An NFL spokesperson told the Chicago Tribune that negotiations about the anthem policy are still taking place. “The NFL has been engaged in constructive discussions with the NFL Players Association regarding the anthem and issues of equality and social justice that are of concern to many Americans,” the league said in a written statement issued through the spokesman. However, despite the freeze on punishment for players not standing, the league said it expects players to stand during the anthem. The NFL television ratings dropped nearly 10 percent in the 2017-18 season, attributed in part to people upset that players were choosing to kneel during the anthem. A study conducted by Rasmussen Reports of approximately 1,000 Ameican adults revealed nearly one-third (32 percent) answered they were less likely to watch an NFL game because of players protesting during the anthem. Thirteen percent said they are more likely to watch a game because of the protests. Many of the viewers who opted to stop watching NFL games are black, according to the survey. A Yahoo Finance poll of just over 9,000 people found that nearly 62 percent of respondents said they would watch less NFL action in the future. 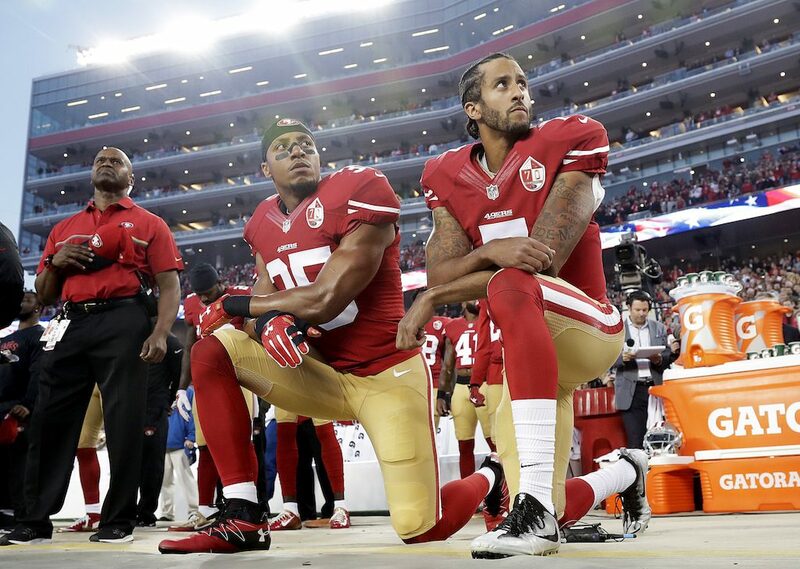 In October, another poll also indicated that the NFL used to be the most liked sports league in America but after the wave of protests, it had become the least liked sports league. President Donald Trump has weighed in on the issue multiple times since the protests started. He issued a new statement on Twitter on the morning of Aug 10.